Rohini Devasher’s ‘Parts Unknown: Making The Familiar Strange’. “Indian artists reach for the stars with telescopes, domestic objects and lost constellations, Indian contemporary art takes a shot at cosmic phenomena and astronomy. After chasing eclipses across the country, artist Rohini Devasher travelled to some of the most hallowed sites of Indian astronomy in 2010. Her first stop was the Indian Astronomical Observatory, the second highest optical telescope in the world at 14,500ft above sea level in Hanle, Ladakh. Her field investigations resulted in Parts Unknown: Making The Familiar Strange, a suite of seven videos plotted against a drawing of the quadrant of space that is home to the Pleiades open star cluster. The videos were windows to a hybridized terrain—they seemed to be of Hanle, but had an extraterrestrial appeal to them, merging the familiar with the strange. First shown in 2012 at the Kochi-Muziris Biennale, Devasher revisited Parts Unknown in 2016 at the Spencer Museum of Art, Kansas, US. 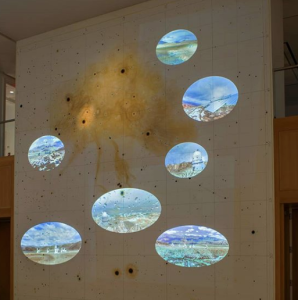 The Delhi-based artist is known for the extensive use of astronomy in her practice, having visited the Giant Metrewave Radio Telescope near Pune, Maharashtra, and the Scottish Dark Sky Observatory in Ayrshire, Scotland. “All these trips were extraordinary. These sites, hidden away from civilization, are almost symbolic of the individuals that populate them. Astronomers escape the city as often as possible to find the stars, unspoiled and untouched. Astronomy offers that form of escape, far from people and places,” says Devasher. Delhi-based Raqs Media Collective, founded in 1992 by three independent media practitioners Monica Narula, Jeebesh Bagchi and Shuddhabrata Sengupta, maintains that the later impact that Italian astronomer Galileo Galilei had is undeniable. “When he dared to postulate a heliocentric understanding of space, he didn’t just make a contribution to astronomy. He transformed the way people understood hierarchy, stability and change. This was a revolutionary transformation of the world,” writes Raqs in an email. Raqs has curated an exhibition that opened on 31 October at the Museu d’Art Contemporani de Barcelona (Macba), called In The Open Or In Stealth. Among the artists invited to participate are Devasher and Pakistani artist Mehreen Murtaza whose work refers to the late Pakistani astrophysicist Abdus Salam. Raqs says Devasher’s and Murtaza’s practices are expanding the borders of contemporary art in our milieu. “A curiosity about space, or about the deep oceans, expands our ways of thinking, wrests free from narrow, sectarian and nationalist boxes, and provides a more capacious frame within which to think questions that have political and ethical implications. Some of the most intensely political and philosophical literature being produced today is in the science fiction genre, which allows us to take nothing that we see around us for granted…. We have to become comrades of cosmonauts and deep-sea divers,” Raqs adds. Looking outward, therefore, means looking inward, a marriage of astrophysics and metaphysics. “Astronomy is as much about an encounter with the self as it is an experience of space and horizon. It gives me a sense of perspective; it is both hugely humbling while being simultaneously empowering,” says Devasher. Raqs has created two significant pieces—an installation called The Museum Of Lost Constellations and another called The Blood Of Stars. The former was exhibited at the Observatory Museum, Stockholm, in 2018. It was based on the diverse constellations that had been named over the centuries before the International Astronomical Union designated 88 “official” ones in 1922. The Blood Of Stars was an immersive site-specific installation in ex-military cave-tunnels in northern Sweden. “As you know, the iron in our blood comes from celestial bodies—we share our basic building blocks with stars,” says Raqs. Raqs says their interest in astronomy is part of their commitment to having their “consciousness altered and expanded”. “…We observe clouds, the intensity of sunlight, the smog in the air, tidal patterns. We read everything from star tables to atlases of distant planets. We talk to others—like, for instance, to a retired astronaut who told us that the most challenging thing she felt about being on the International Space Station was getting used to 16 sunrises in 24 hours,” Raqs says. Devasher allowed her twin passions to take wing early on, having joined the Amateur Astronomers Association Delhi (AAAD) the same year she started her bachelor of fine arts in painting at the College of Art. At AAAD, Devasher discovered a diverse group of astrophysicists, photographers, entrepreneurs and academics united by a common love for stellar phenomena. “In 1997, it was the closest thing to a science fiction convention in the city,” she says. “Astronomy shares a lot with science fiction and speculative fiction, where the underlying question is “what if?”. The answers to that question are always more interesting,” she says. This entry was posted in Raqs Media Collective, Rohini Devasher and tagged In The Open Or In Stealth, Livemint, MACBA Barcelona, Raqs Media Collective, Rohini Devasher. Bookmark the permalink.